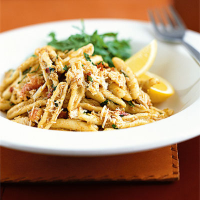 Make this quick dish, that's ready in under 20 minutes, using our new cicatelli shaped pasta, with fresh dressed crab from the Fish Service Counter. Cook the pasta following the instructions on the pack and drain well, reserving a little cooking water in the bottom of the pan. Meanwhile, heat the olive oil in a large frying pan and sauté the garlic and crushed chillies over a low heat for 1-2 minutes, until the garlic has softened slightly, but not browned. Add the crab meat, lemon juice and parsley, season well and heat through until piping hot. Add the pasta to the crab mixture, along with the reserved cooking water, and mix well. Serve with a lightly dressed rocket salad, some warm ciabatta and lemon wedges. Try our new range of pasta, from the village of Fara San Martino, Italy, renowned for the excellent taste and texture of its pasta. Available in a wide range of shapes and sizes, all of which have quick and easy recipes printed on the packaging. Albariño Pazo de Seoane, Rias Baixas, is made from Albariño, the speciality white grape of northern Spain. Its refreshing acidity and full tropical fruit flavour works very well with seafood, but has sufficient intensity to cope with the chilli. This recipe was first published in Fri Oct 01 01:00:00 BST 2004.